Do you envision yourself working in the medical industry, delivering essential care to those who need it the most? Do you want to be an instrumental part of the healthcare industry? 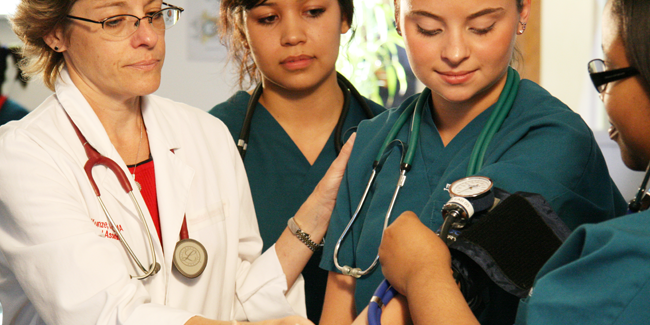 Medical assisting may be a great fit for you. A Medical Assisting Diploma from ECPI University’s College of Health Science could prepare you for this rapidly growing field, helping you to develop the knowledge, technical skill, and computer proficiency you’ll need to help others. Best of all, the Medical Assisting Diploma program can be completed in as little as 12 months through our full-time curriculum. * Bureau of Labor Statistics, U.S. Department of Labor, Occupational Outlook Handbook, 2014-15 Edition, Medical Assistants, on the Internet at http://www.bls.gov/ooh/healthcare/medical-assistants.htm (visited August 11, 2015). Graduates may work in a variety of settings including clinics, physicians’ offices, and related healthcare settings. *These courses available for Medical Assisting students online. Demonstrate characteristics of self-direction and accountability with strong educational foundations for lifelong personal and professional growth. Demonstrate critical thinking skills to effectively address patient care and to adapt to the rapidly changing challenges in healthcare and medical assisting. Provide clinically competent, contemporary care that recognizes individual differences and promotes caring behavior in the health care community. Function as competent, beginning practitioner in both clinical and administrative procedures for the medical office. Be eligible to sit for the Certified Medical Assistant Exam offered through AAMA and/or the RMA exam by AMT. Program provides comprehensive preparation of graduates for work in the career field.